This lovely 3 Star Tourism Council Graded, face brick home can accommodate up to 20 guests (pets welcome), perfect for large friends and family getaways or corporate and team building weekends. It consists of the main house with 5 bedrooms, a flatlet attached to the house, and an extra self contained En-Suite Bedroom. Bedroom 5 is Road Facing with a double bed and a single bed. Bedrooms 2-5 share a full bathroom with bath, shower, basin and toilet. There is also an additional guest loo upstairs. There are 2 single beds in the living area. It has a full bathroom, oak fitted kitchenette and lounge/dining area. Next to the flat is the Independent En-Suite Bedroom with a queen bed. There are also beautiful sea views from the Garden and Flatlet. There is a large, oak, open plan, kitchen that is fully equipped, with a gas stove and electric oven. The kitchen leads into the 12-seater dining room, and in turn, onto the patio with a Weber gas braai and pool table. The comfortable lounge has a 42cm Flat screen TV with Full DStv. There is a gas braai and pool table on the upstairs patio. 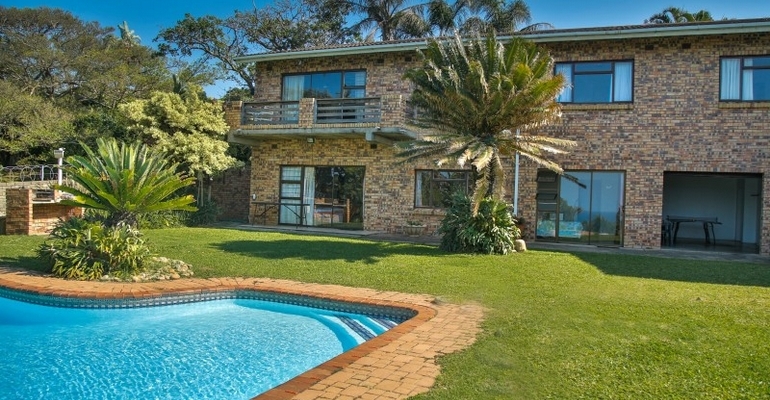 A large sparkling swimming pool is set in an expansive garden with an additional built in braai. We also offer Uncapped Wi-Fi, Volley Ball, a Basket Ball Ring, Table Tennis, Soccer, Cricket, Rainy day indoor board games, a Pool Table, and Darts (bring your own darts). There is a very potent Sound System - Please bear in mind this is a residential area and no loud noise will be tolerated. Outside is ample parking available for 8 - 10 vehicles on this fully walled property, with a very good security system. Out of Season Weekdays: R2,300/night up to 10 people, thereafter R200 per person. Normal weekend Rates: R2,950/night up to 10 people, thereafter R220 per person. Long weekends: R3,200/night up to 10 people, thereafter R250 per person. School holidays: R3,000/night up to 10 People, thereafter R230 per person per night. Christmas,New Years and High Season: R4,000/night up to 10 people, thereafter R300 per person. Deposit may be withheld, and additional charges may incur in the event of cancellation or premature departure. Written instruction for cancellation is required.